Levi's answer to weak sales of denim in the U.S. amid the trend to athletic pants is to move beyond the basic blue jean. NEW YORK ( TheStreet) -- Being synonymous with denim jeans hasn't been such a good thing for Levi Strauss & Co. lately. The privately held company's sales have suffered as more and more women opt for stretchy, printed jeggings from unknown labels and form-fitting athletic leggings from Lululemon (LULU - Get Report) , Nike (NKE - Get Report) and Under Armour (UA - Get Report) , a broad trend known as the "athleisure" movement. Domestic sales of jeans dropped 6% in 2013, according to the latest data from research firm NPD Group. But Levi Strauss, which was founded in 1853, is fighting back by overhauling its product line-up and trying to appeal to female consumers in particular with more comfortable and stylish designs. "Our quest now is to really set ourselves up as a 150-year old startup," said Executive Vice President and President of the Levi's brand James Curleigh. 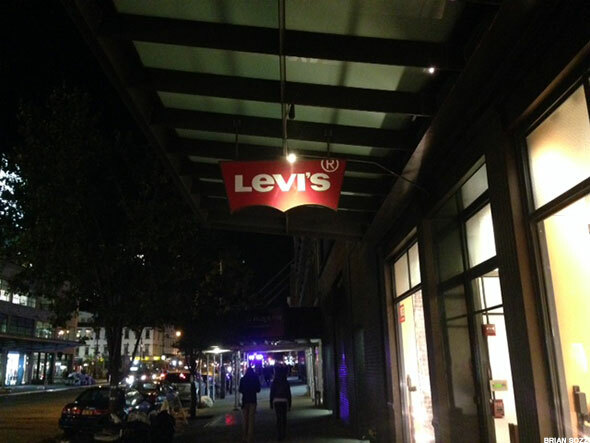 On Monday, Levi's launched its 501ct line for women and men that updates the well-known 501 brand. It features three different fits -- slim, classic and relaxed -- and comes pre-tapered. As the company points out on its website, after hemming, tapering the leg of the 501 jean in Levi's retail stores and tailor shops is the most requested alteration. So why not give customers that taper from the get-go? And in two weeks, Levi's is releasing its "Commuter" series for women, which follows up on a prior launch of the line for men that featured slim fit pants, water repellent jackets, shoes, and yes, a backpack. Commuter, as its name suggests, could best be described as being for a trendy urban millennial that rides his or her bike to Whole Foods (WFM . The female target customer likely has a closet full of yoga pants, and may be on the prowl for that perfect pair of flattering denim to be worn on a Tinder date or evening out with friends. In addition to developing more unique products, Levi's is also trying to infuse technology into the often frustrating task for women of buying jeans that fit perfectly at a department store such as Macy's (M or J.C. Penney (JCP . 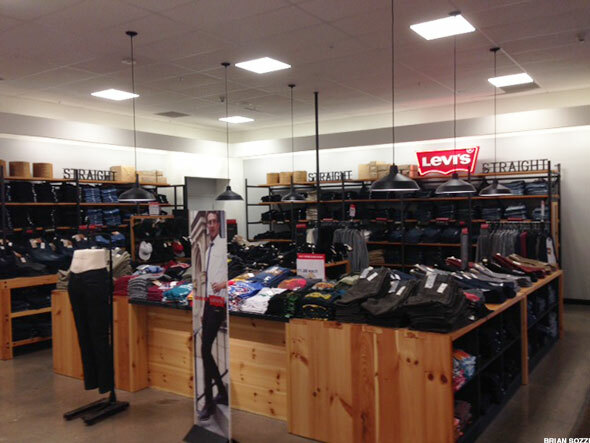 Levi's now has large, digital touchscreen machines in 400 of the best Macy's locations to help select an ideal fit. More of these digital "fit guides" are likely on the way. "We are meeting with Macy's this week to see how we can continue to drive innovation by using technology," Curleigh said. What Levi's is banking on is that by showcasing jeans to women that they don't already own, it can escape the sluggish sales and price wars that have dominated the industry in recent years. "Stretchier jeans aren't going to solve denim's problems, the industry needs to rethink its strategy," wrote Fashionista.com editor-at-large Lauren Sherman in an email. "Jeans are no longer the most comfortable thing to wear, but they still have a lot of fashion cred." Levi's third-quarter sales and operating income in its Americas segment both declined 2% year-over year, mostly due to challenges in the female denim market. V.F. Corp (VFC , the main rival to Levi's through its Lee and Wrangler brands, also had a challenging third-quarter due to lackluster denim demand from women. U.S. sales for Wrangler fell by a mid-single digit percentage in the quarter, while Lee notched an 11% decline. But there are signs that re-thinking the DNA of denim for women is working for Levi's and V.F. Corp. According to Curleigh, the conversion of female customers from shoppers in its stores to buyers has been positive throughout 2014. Levi's best-selling products last year were its skinny jeans, products with stretch material, and others that served up a bit of style beyond the basic blue jean. As for V.F. Corp, its jeanswear group president Scott Baxter recently said that tests of its new "performance denim" line, Wrangler Cool Vantage, have been producing strong results and that the company plans to roll it out more broadly this year. Curleigh said that the question now is "whether Levi's can play a role in performance, through comfort or a derivative of sport performance." He certainly hopes the answer is yes, putting the pressure on trendsetters in the athleisure movement such as Lululemon, Nike and Under Armour to come up with the next big thing.